Muppet Central News - Farscape's thundering climax unleashed in "Peacekeeper Wars"
Farscape's thundering climax unleashed in "Peacekeeper Wars"
Imaginative, visually impressive and with enough gunfire to satisfy the most diehard space battle aficionados, "Farscape" returns to Sci Fi Channel to present an entertaining adventure, along with the kind of giddy humor that only an ardent fantasy fan can love. But wait -- there's also legitimate drama to which viewers can relate. Following the story may be tough going for those new to the series, but patient viewers should be able to get the gist of things. 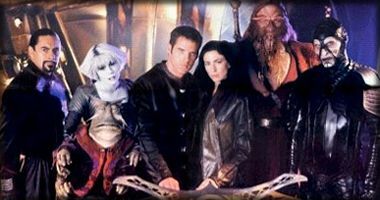 The story centers on a fine ensemble of actors, with Ben Browder playing lost-in-space astronaut John Crichton and Claudia Black as fierce warrior Aeryn Sun. They have finally accepted that they love each other, a very good thing because Aeryn is about to give birth to their child. 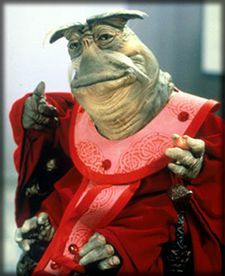 To complicate things in "Farscape: The Peacekeeper Wars," a galactic war has sprung up between the Peacekeepers and the reptilian Scarrans, both of whom are ruthless in combat. In a desperate attempt to put an end to the war, Crichton and his allies journey to reunite members of the Eidolon people with their ancestors, who possess legendary powers to broker peace between warmongering races. Among the hero's reluctant allies is his old nemesis, the sadistic Scorpius (Wayne Pygram). A praiseworthy element in this miniseries is the way the characters have grown from their debut several seasons ago. The always-heroic Crichton, now colored by desperation, makes several decisions that flavor his character with interesting flaws. Having a baby changes Aeryn in interesting ways. Enduring stalwarts Ka D'Argo (Anthony Simcoe) and Chiana (Gigi Edgley) also evolve and mature. Other characters, too, move from selfish absorption to more worthy traits. As before in the series, the outer space visuals are elegant and compelling. Moya, the living spaceship that serves as transport and host to our heroes, is convincingly under pressure, and you'll find that even a puppet (the Pilot, voiced by Lani Tupu) can express dramatically convincing disappointment. Best of all, there's a thundering good climax that makes a solid point about unleashing weapons of mass destruction.